Great news for travelers and Piso Fare enthusiasts! Air Asia Red Hot sale will soon be available!!! Yes, the much-awaited red hot sale where ticket base fare may be as low as P16 will be up for booking less than 8 hours from now. Read this AIR ASIA RED HOT SALE POST for the promo details like booking dates and travel period. 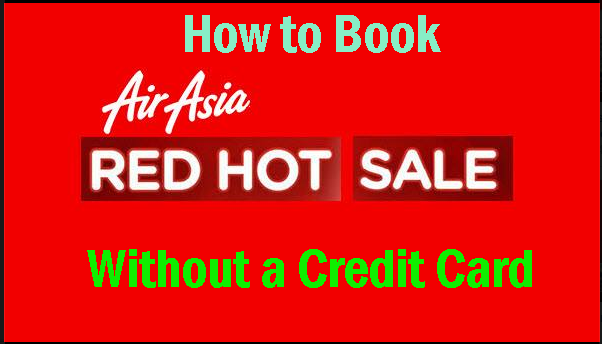 The fastest way of securing the Air Asia red hot sale tickets is thru online booking. However, not everyone has a credit card. Can you book the Air Asia promo fare without a credit card? The answer is a big YES. Travelers who have no credit cards can still book Air Asia regular and promo seats. Find out how below. Getting your ticket by online booking and paying even without a credit card is possible. Air Asia has the following payment options available for online booking. Internet banking (direct debit) thru Dragon Pay Facility– You can pay via this facility if you have internet banking facility with Metrobank, BDO, BPI (Mobile/Online), Land Bank, Union Bank, UCPB or BPI Globe Banko, Globe GCash. Air Asia Payment Centers– If you cannot pay by credit card or thru Dragon facility, you may pay your tickets thru Air Asia accredited payment centers such as : Bayad Center, EC Pay, Cebuana Lhuillier, Robinson’s Department Store, The SM Store and 7-Eleven. Bring your transaction summary when paying at the chosen payment center. -Take note that you have only 12 hours to make your payment. Failure to pay within the allotted time will automatically cancel your booking. -With processing fee per person per itinerary plus additional VAT for domestic flights. Payments are accepted only for international flights departing from the Philippines more than 5 days before scheduled date of departure. For any inquiry, please contact Air Asia Philippines at (632) 722 2742 from 7AM to 11PM, Monday to Sunday. Booking for the Air Asia red hot promo? You should if you want to travel without spending too much! Also, you can save up to 50% on baggage fees if you will pre-purchase your Checked Baggage during initial booking of your ticket. For example, you will be bringing 15 kg as checked baggage for a domestic flight. During initial booking the 15 kg baggage will cost you P250. After initial booking, you now have to shell out P288. When you pay for the 15 kg bag at the airport counter, you have to pay P800. So, when you expect to be checking in heavy bags, better purchase a Baggage Allowance during the initial flight booking. Book your Air Asia Red Hot Sale Ticket and fly to your desired destination! LIKE and FOLLOW us on Facebook at PISO FARE TICKETS for more airline Promo Fare, PISO FARE 2016, PISO FARE 2017 and travel tips!